The vast majority of searchers (almost 90%) choose an organic search result over a sponsored ad. Need an affordable SEO package that delivers page one results? Our website optimization services provide Philadelphia area and Central Florida business owners the ROI you demand. 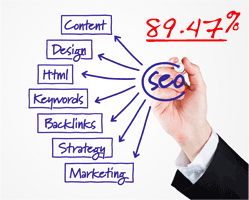 We are experts in small business SEO since 2003 and use best practices that stand the test of time. As your online marketing agency, we will also optimize top tier local directories like Yelp for Business and Google Places for Business (Google Plus Local). Any local SEO campaign is incomplete without claiming valuable local business listings. Let’s find your most valued local profiles today. Mobile marketing is a must for all businesses large and small.We offer intelligent Google mobile advertising solutions that convert browsers into buyers. We build inexpensive mobile websites, mobile landing pages and develop mobile ads that work. Need YouTube advertising for your promotional video? Our advanced video SEO techniques increase YouTube views for your marketing video. Our web video production team can add music, animation, text and special effects to raw “How To” videos.